I’d love to get your thoughts on this. As always, constructive criticism is helpful and most welcome. I would really like to open an online shop before Christmas and sell this kind of thing. I’ve wanted to do it for years, and just starting to feel the urge to really DO it. If you think it needs something added (or subtracted), please do let me know! Thank you so much! Happy glorious almost Autumn weekend to all! Peace. < Day 3: Don’t Leaf yet, I just got started! Thanks for your feedback! So many decisions….. I think you make a great point. I appreciate your comment! Thanks, Kerfe. I was especially interested in your thoughts on this, as a textile artist. I was planning to paint the sculpey piece. I was thinking something in the blue/green family, but keeping it light, so it wouldn’t blend too much the border. And not even sure where to place it (it’s not been attached, yet). Realistically, do you think something like this would sell? I’ve put a bit of money into supplies and fabric for this venture, and not wanting to throw good money after bad, so to speak. So don’t be shy about expressing any concerns you might have! My experience in sales is generally bad. I know people sell things, but how they manage it, I haven’t yet figured out. People buy things that make me scratch my head, and things I think are wonderful never get sold…I think you need the advice of a marketing person. It’s all marketing, I think, the product is secondary. Yes, add the seagulls! And maybe use some colored embroidery thread. Keep going! I like Kerfe’s idea of a mysterious message! Thanks, C. Realistically, do you think something like this could sell? I’m trying to decide whether to go whole hog and open a shop……or not. Well, I don’t know about art quilts – I have sold successfully in the craft arena doing handmade cards and handmade jewelry and what I do know is this: people love things that are beautiful and unique. So make it beautiful and unique, and if it’s something YOU love and want to own, keep, look at – then you are more than halfway to a sale because chances are someone else will feel the same. Find a good honest critic and here may not be the place because if you are selling goods not digital images the actual piece loosk/feels different than a photo and on the computer. If you plan to sell the items on say eBay or Etsy, that’s different because then you do have to attract the eye digitally on the computer. So that is a consideration as to your constructive criticism. I knew I had good, sellable things when I didn’t want to part with them. That’s a key too. Create what you love and you will find customers for your artwork. I hope this is helpful! That sounds like really good advice. Thanks for taking the time to comment. I really like the part about not wanting to part with something being key. That’s really good. Thanks, C! Jodi, thank you! Maybe it would look better without that piece completely? I may do a whole other post without it and see…..
Maybe. Would like to see. Though I love the seagull idea. I just edited it and saved it without the sculpey piece – not sure if it shows up on your end just plain now? Yes! Oh Laura! I love it so much more without! To me that was a distraction from your beautiful painting and the beautiful stitching It all comes together as a scene now. Just my opinion but love! YAY! OK, thank you Jodi!! 😀 And thank you so much for telling me what was wrong so I could change it! We get too close to the things we create! I don’t know if it was wrong … Just what I like. I don’t want to dissuade you from YOUR art! You know, Vic didn’t like it either. Granted, it is stark and unpainted now, so that is part of it – but I wondered if I should leave it out of this one. The focal point of this piece is the painted panel, and maybe the sculpture was just too much of a distraction. I think your instincts are right on, Jodi. You have that “thing” that I don’t have! I don’t know what it’s called, but it’s a flair and a style and a way of putting something together instinctively and it just being right. I know people like that, but I’ve never been one of those people. I hem and haw forever and often overdo things! I trust your instincts! Wow!!! What a compliment. You have made my day. But trust your instincts. You don’t give yourself enough credit. Go with what makes you happy. 😍. Ps. I was at the gym trying to type on the elliptical when I wrote this and put it on someone else’s blog – OH BROTHER! LOL! you flatter me so…. thank you for your confidence in me – LOL! Speaking as a tentative starter in art quilting but also putting my customer’s hat on as well, I think I would prefer to see the sculpey piece painted as it looks a bit stark left white. I love stitch as well, so some interesting texture created with stitch would please me. Keep it subtle and interesting and appropriate to the style and colou if the piece. I do like the idea of the handmade buttons you mention as well. Thanks, Barbara! I’ve now removed the Sculpey piece completely, and took another photo and edited the post – do you like the piece better without it? I really appreciate your feedback! Here are my thoughts: When I look at it, I see three light, pretty pastel colored strips of fabric on top of a dark background that forms more lines around it (as a frame) and then in between. That’s all I see. What do you see? What could make it more interesting? What are you trying to achieve? 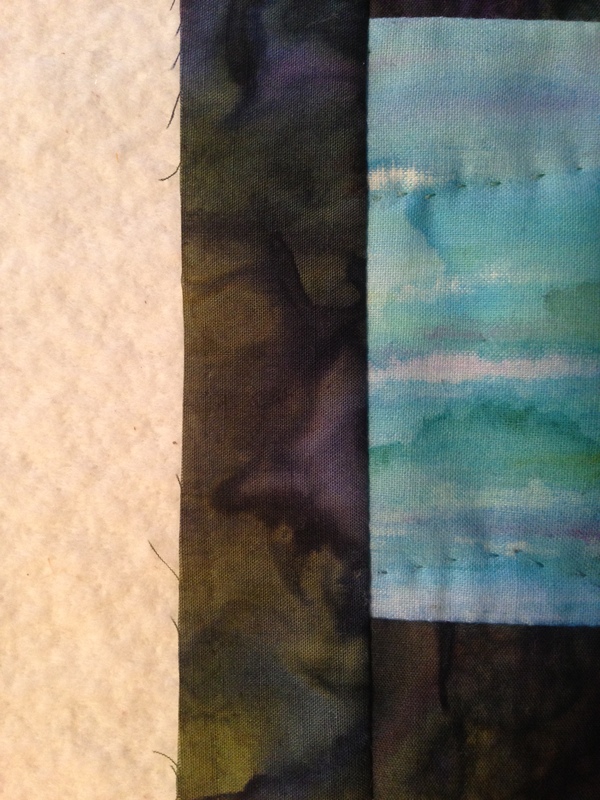 When you paint the fabric, you do so because you can’t buy fabric with your colors, your effects, your design. Then when you sew it on, you do so because you want to create an interesting arrangement. I’ve made handmade pillows that had beads sewn on, ribbons, and used my own fabric created by printing an image (of a card I made) onto the fabric right on my own paper printer (using special fabric). My “art pillow” was a collage. You need to approach your art quilt as if it were a collage too. Do you like making collages? You would arrange your pieces of fabric before sewing them down. Have a bit of a plan. Is this in any way helpful to you? You can also approach the art quilt as if it were an abstract painting OR a painting. But whatever way you approach it, you are dealing with bits and pieces you sew together. Combining things. Maybe look at some Japanese quilts (see here:https://furugistarjapan.wordpress.com/2011/02/18/boro-japanese-folk-fabric/ ) for ideas. Yeah, that’s the way I’m approaching this particular piece…..more like a painting on a piece of fabric. (BTW, that link you posted has beautiful work!) And maybe the fact that you’re looking at a picture of the quilt vs. the actual quilt isn’t helping much too. Hmm…..definitely food for thought, but I’m not looking to make a collage out of this. I do want to experiment with those techniques and maybe incorporate them into future work – and my work may take a turn that way once I learn those techniques – but for this piece, what I was trying to do was to take the abstract paintings I had done in my art journal with the Neocolors that were so soothing and relaxing and take that same feeling onto a piece of fabric and turn it into a little quilt. That’s all I was looking to do. I do start to think that maybe trying to add more to it may defeat the purpose – of this piece. But, no doubt, I do want to try those collage techniques, and really see where that goes as well. I really appreciate your time and honest feedback, C! Thank you so much, Beth! I’m glad you like it as is! Quilting is quite a process. I don’t make quick decisions hehe. Happy creative weekend to you too! Beautiful small quilt Laura. There are some very of good ideas shared with you this morning. I like the Tri tiered effect. Enjoy the process and have a happy day! Thank you, Sharon! Have a great day as well! When I first saw you posting about creating a quilt, the image I had of the end result was something like this.. I like the hand sewing, it adds more texture to the quilt and you could create a scene with a constraining thread? Thanks, Kari! I thought about adding something to the side of this also. My instinct right now is telling me to keep it simple, but I think you make great points. It would add interest. Maybe I should add more stitching as well – might help it translate to the screen better, since I plan to sell online vs. in a brick and mortar type of shop. I’d like to do more intricate art quilting like the link you shared in future, but for right now, I’m trying to mingle painting with quilting. Maybe I should keep it even more simple and just sell small paintings! I’ve also thought about incorporating paintings on wc paper into quilts. So many possibilities that my head spins when I think about it! (And it keeps me awake at 3am too!) I appreciate your feedback! Such beautiful colors! I never saw the original, so can’t comment on how it’s changed, but this is lovely. So this is a wall hanging quilt? I’m not sure about a fringe, but some gull beads might be nice and complement the watery scene. Are the stitches supposed to pucker like that (as seen in the top photo)? I probably should have ironed it, Teresa. I was hand sewing while listening to a webinar relating to my day job, and kind of rushed through a bit. Yeah, this one is meant for the wall. It’s so small, not sure how much of a statement it makes. Thanks for your feedback! I wasn’t sure whether the puckering was meant to be part of the effect or not. 🙂 Still beautiful colors! Laura, I liked the white line. I really like how you cut your painted piece. It looks like an abstract landscape. I am at the marina with very poor internet so can I view on my phone. The dark background material shows up brown and then in another photo as a rich teal color. So not sure what color it is. Love what you are doing!!! Thanks, Carmel! It is dark green and dark (midnight) blue. Maybe you’re seeing the teal in the dark green areas. It’s definitely not brown. It’s amazing how lighting changes the look of a color. I’m glad it looks like an abstract landscape, because that’s exactly what I was going for! I’m glad you like it! Hi Deborah – hopefully in someone else’s home, since this item will most likely be for sale when I open my online shop (fingers crossed) in October! 😀 I’m glad you like it! This is lovely Laura and I like the idea of adding the seagulls – the deep background trim is perfect fit for letting the artwork panels stand out. Thanks, Mary; I really appreciate your feedback! It could make more sense if that were the only goal. 😉 But since when are artists supposed to make sense? When your muse tells you to do something, it’s best to listen. If you love it, then DO it! Good point, Charlie! I do love both. I think when I open for business, I will offer both! Thanks for your help! So this is what art quilt is!! Fantastic!!! You just opened my horizons to something I never dreamt…it is lovely!!! Laura, I’m glad you’ve decided to remove the sculpey piece. You could enhance the design with subtle embroidery in varigated threads that blend and take it out of the rectangle areas here and there. it’s quite lovely. Thanks, Rachel. I think that’s great advice, taking it beyond the panel areas. I appreciate it! Awww thank you Jill! What wonderful advice, and so freeing! You are absolutely right. I’ve been hemming and hawing (as usual) about this and what you are saying rings true! I’m also glad you like this! Although I enjoyed painting on the fabric with the Neocolors, I’m thinking that a primarily pieced (fabric) quilt would most likely be much faster to create. I’d like to really play with the idea of making lots of funky quilt tops and see where it goes. 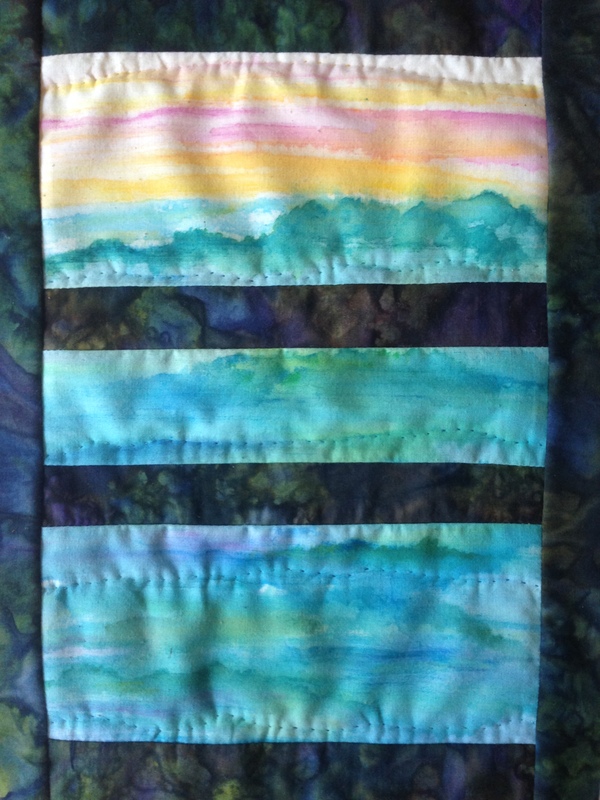 I’d still like to incorporate watercolor paintings (on wc paper) into my quilts too. Thanks for your feedback and advice, my friend! And your doodles actually ARE art, IMO. They are gorgeous and intricate and cool! I hope things slow down for you soon…..are you still planning to going to the writing/illustrating conference? Or has that already happened? Wow, your hubby works hard!! And I’m sure you do too. Blogging really does take a lot of time, way more than I thought, but then it’s brought more to my life than I thought it would too! I hope this fall brings lots of productivity to us both, Jill! I think you’ll be a wonderful children’s book illustrator. Thanks, Ann! I may call it done, it didn’t get really a great response here….not sure if it’s worth investing more time in. I was thinking of binding it off and putting it for sale and just see what happens. If it doesn’t sell I could add more to it. I’m glad you like it!! I was curious what you’d think. When will you start you next quilt? Or are you working on it already? I have a big project to finish in the office and then I’ll start. I have a lot of quilts to make if I want to open a shop in October! We’ll see where this goes. I expect most of the quilts I open with will have little or no painting on them, and if I develop a patronage that are interested in the quilt paintings then I’ll definitely do both. I’ll make what I love and whatever sells, I’ll make more of. I realize it’s tough to break in to this business, but it’s calling me so strongly that I have to give it a shot! And you really should!!! I think it´s really cool that you´re saying you will do what you love and whatever sells, you´ll be making more of it. That´s the best approach to it I guess. I know it´s hard to start a business like that, I think I haven´t sold anything yet… But I´m not that much into advertising my stuff, maybe that´s the problem… I think advertising is a huge point, making a Facebook page to it, maybe even pay FB to advertise your stuff… I´m so curious how things will work out for you in this whole thing! And I can´t wait to see more quilts! What´t the size/extend of such a quilt? Well that one is pretty small, I’ll say 9×12″, something like that? I’d like to start with small ones so that I can keep the price down and so it’ll be easier to ship. If I get requests for larger ones, then great! Wow it is beautiful loving the colors! Thanks, Jennifer! I’m so glad you like it!